If you met my dog Laika during the day you’d have no idea she has arthritis. She’d gladly run 5 miles, hike a mountain or swim for 7 hours straight. And that’s what makes arthritis hard to manage – she still wants to do all those things during the day, but I can’t let her. I have to limit her exercise every single day. If I don’t I’ll she’ll be in pain later on, and no one wants to see their dog in pain. If she bolts out the door and takes off after a rabbit she’s going to be in pain later. One quick sprint is all it takes to make her night miserable. As hard as I try to manage my dogs activities during the day accidents happen. Sometimes it’s that quick sprint after a bunny, other times it’s an unexpected bolt up the stairs. Why Do Dogs Limp at Night? Dogs that have arthritis can be difficult to manage because their pain isn’t necessarily present during the day. My dog rarely shows any signs during the day, it’s at night when her symptoms come out. Now this is what makes arthritis so hard to manage – too much exercise causes soreness, too little makes them stiff. Finding the right daily exercise routine for your dog is key. Low impact exercises & maintaining a healthy weight help make arthritis more manageable. They keep your dog trim which reduces extra pressure on their joints, and those exercises help keep your dogs muscles strong. Walking, swimming, and indoor games are great exercises for dogs with arthritis. Avoid strenuous activities that put a lot of pressure on their joints such as playing frisbee or jogging. Maintaining a healthy weight makes arthritis easier to manage. Despite how much effort I put into trying to keep Laika’s exercise low impact throughout the day we still have nights where she suffers, especially during the winter. Nights where it’s hard for her to get up on the couch, and nights where she limps. 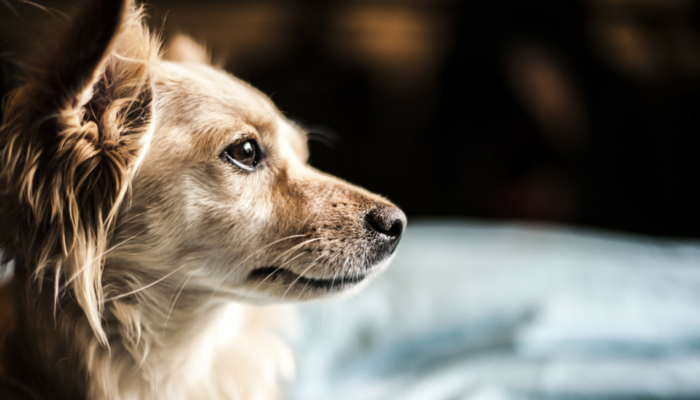 Here’s 5 methods you can use to help manage your dogs arthritis pain. I know there’s a lot of articles out there that say you can manage your dogs arthritis naturally. That’s fine, but in our case those methods weren’t enough. We tried four different holistic options, but unfortunately they didn’t work for us. Rather than see my dog in pain during those rough nights I give her prescription pain medication when necessary. When you’re dealing with a chronic disease like arthritis you have to realize that some days are going to be worse than others. Those nights where your dog is limping & in pain – those are the nights where you use medication to help ease your dogs pain. Pain medication isn’t something that needs to be given daily either. We opted for a NSAID (non-steroidal anti-inflammatoty drug) which helps reduce inflammation & ease pain that we give Laika on those bad nights. While there are some potential side effects we had to weigh the risk vs benefits, and our veterinarian helped us come up with a list of things to look out for. When it comes to pain medications there are a lot of options. Speak to your veterinarian about what medications are right for your dog. There’s a lot of medication options available for arthritis. Talk to your veterinarian to find the one that’s right for your dog, and remember to ask about the potential side effects. If there’s one supplement that’s known to work well for arthritis it’s Glucosamine. I’ve noticed improvements when using them, but unfortunately we haven’t yet found a brand that works great in the long term. The problem I’ve found with glucosamine is that they work really well for a couple weeks and then seem to taper off. You switch to a new brand and the same things happens. They work well for a few weeks then taper off. We’ve tried 7 different brands but they’ve all had limited effects after a month or two. While we’ve found that they do work remember that there are a ton of brands out there, and your results will vary. Dogs may have great results with one brand, and none with another. And it’s not uncommon for brands to lose it’s effectiveness after awhile. To gauge the effectiveness of glucosamine I’d recommend taking notes. Give your dog the supplement in the morning, and then keep your dog on a routine schedule for 10 – 14 days; the same walk, same play, same activities. At night (or when your dog tends to get stiff or limp) write down on a scale of 1-10 how well your dog seems to be doing. After a couple of weeks look back and see if you’ve noticed an overall positive difference in your dogs arthritis symptoms. If you don’t notice any changes it’s time to consider switching to another brand or looking into other options. Keep in mind that the glucosamine may be helping, but it might not be enough to manage the pain on it’s own. Another way I help ease Laika’s discomfort as night is with a massage. And to be honest I don’t know how much they help versus the fact that Laika loves getting massages. Sometimes she’s still limping after, but usually she’s in a deep sleep. Results may vary. On cold nights I use a heating pad on Laikas hips as we watch TV on the couch. The great thing about modern heating pads is that they don’t get too hot, not like those plastic ones in the 80’s we had. But to be safe I’d try it yourself first to make sure the heat isn’t too intense. Since Laika usually has the “I don’t want that touching me” attitude I thought we’d have to work on getting her used to the heating pad. Well, I was wrong. She loves that thing and has since the very first time I put it on her. Even on nights when she’s not showing any signs of discomfort she comes running over if I grab it with that look of “yes please” on her face. Does your dog have a hard time getting up on the couch or into your car? You can buy a ramp or build one with some shelving & carpet to make climbing easier. If your handy you can save yourself some money by building your own ramp. Google “DIY dog ramp” & check out all the various plans. Does your dog have a comfortable place to sleep? 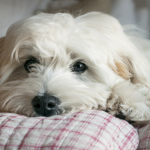 There are many orthopedic bed options available that can help support your dogs achy joints. 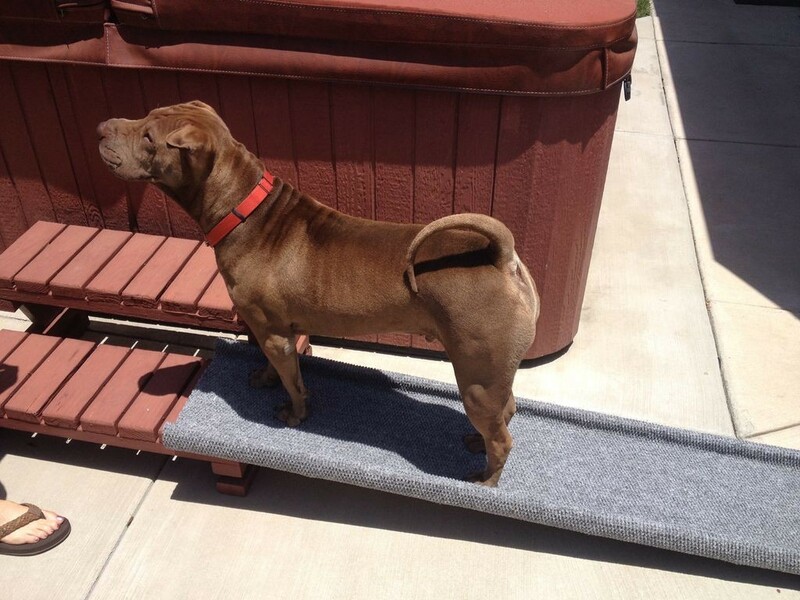 Foam options are a popular choice because they contour to your dogs body & can help alleviate painful pressure points. Some of these products are pretty expensive ($180 for a dog ramp! ), so I recommend doing your research before investing in them. If your handy look up some DIY ramp options. And to make life easier choose a bed with covers that can be taken off for washing. Take leisurely walks and give your dog a chance to sniff around. By taking the “go go go” attitude out of our walks we’re able to take it easy. Walking is just as much about exploring as it is physical exercise. Our dogs love to find out what’s going on in the neighborhood and they do that by sniffing around. You can either let your dog stop & sniff when they want or just make a few “sniff stops” along the way. Play lots of indoor games to keep your dogs mind busy. Just because you can’t go out & play frisbee anymore doesn’t mean you can’t have fun with your dog. To keep Laika mentally stimulated I found some indoor games she enjoyed. The “go find it” game with some treats, hide & seek & stuffed Kongs are some of her favorites. Keep your dog at a healthy weight. A few extra pounds is a lot of extra pressure on your dogs joints. Help keep your dog trim by maintaining a low impact daily exercise routine and by cutting out any extra treats. 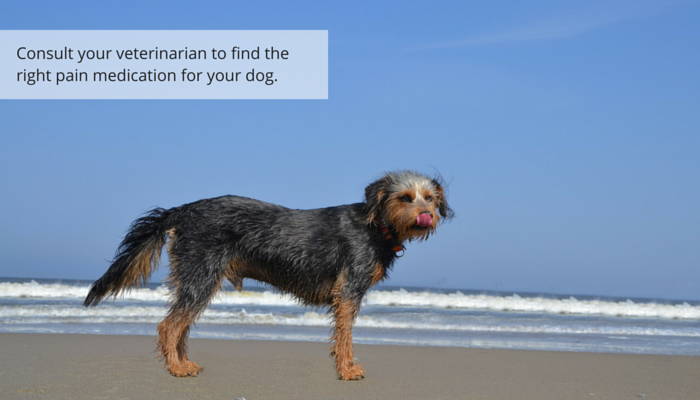 Maintain regular checkups with your veterinarian. Arthritis should be monitored on a regular basis. Talk to your veterinarian about your dogs symptoms so you can come up with a management plan together that’s right for your dog. 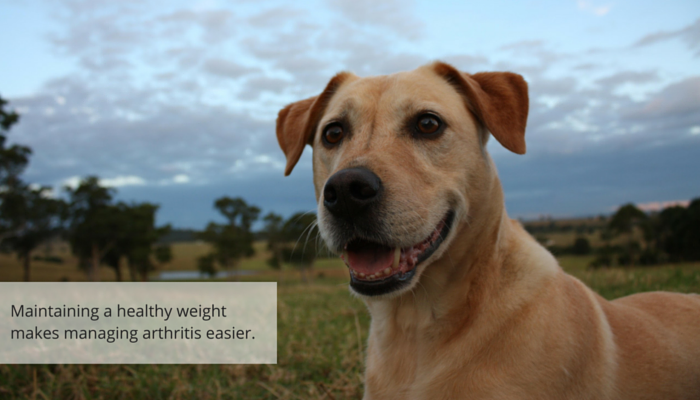 What Do You Use to Help Ease Your Dogs Arthritis Pain? 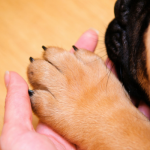 Does your dog have arthritis? Does your dogs limping get worse at night or when they first wake up? How to do help manage their pain? Disclosure: I am not a veterinarian. 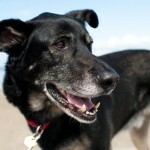 This article is intended for owners trying to help manage osteoarthritis pain in dogs. If your dog is limping and you’re not sure why please take them to the vet for a thorough examination. Sydney and Rodrigo have arthritis. They take a natural anti-inflammatory called Duralactin that I got from their vet. I also add In Clover Connectin and System saver to their meal. And the veggie mix that I make contains turmeric and green lipped mussel. All of which work to alleviate inflammation and joint pain. Now that I’ve typed all that out, I come across as a mad scientist. But they’re doing well! We haven’t tried Duralactin yet, I’ll definitely look into it. Been using tumeric, haven’t tried green lipped mussel – another thing to look into. I’m hoping the weather warming up make Laika’s arthritis easier to manage. You’ve got so many great tips here! Haley used to be just like Laika, limping at night if we happen to have a little too much activity on a particular day. Late last year, our vet recommended Adequan and I was blown away at how well it worked for her. It was like she became three years younger after we started her on it. I think some vets might not recommend it at first because it only comes in an injectable form but it’s very easy to give the injections at home once a month. Here’s a link to the post I wrote about Haley’s experience with Adequan if you think it might help Laika. I’m actually going to be bringing up Adequan the next we’re in. ( I mentioned your post in a comment from another Adequan post earlier this week – http://lessonsfromaparalyzeddog.com/chose-give-dog-adequan-canine-fight-arthritis/ ) It’s something I’ve had in the back of mine mind since reading yours, and then it was a “Oh yeah, why didn’t I ask about that?” moment when I saw it mentioned again. My girl acts stiff and sore at times. It makes me quite sad. Thank you for these tips! 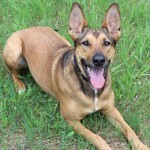 We are at the beginning of dealing with arthritis in our 5-yr old mixed breed. I was shocked to learn it can happen at her age, and was confused at the nighttime-only symptoms. Thank you for the great ideas, and for sharing Laika’s story. It is comforting to see all the options, and thank you to those who have commented as well.